As I walked along the hallway this morning, I looked up against the wall and there was a particular image that jumped right out at me. It is not the first time that this has happened, but today, I felt like taking some action, more like taking matters into my own hand and just remove it from the place it has been hanging for some time now. In that quick instance though, I had a change of mind and as I made my way into the elevator, I became consciously aware, that even if I did remove the image because I felt no one was in sight to see me, God is always looking and He sees everything. I also questioned my level of awareness. How aware am I in other areas of my life? What is your level of awareness? You and I are really special because we live, breathe, move and have our being in the one, our Creator who has total awareness. Not only that, only a spiritual being has awareness. Awareness is empowering. 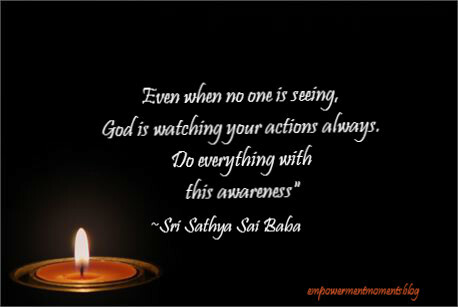 Awareness empowers you to take action, only that we must strive to always make it a positive one. Awareness is a key to growth and a catalyst to moving our consciousness into a new dimension. It's a new experience in life and one that brings you to the edge of yourself and possibly, your greatest encounter with God.